With the sun shining and a pinch, note just a pinch of warmer weather hitting, I have been craving fruit! I am actually craving it! All night I was laying in bed thinking of a glorious fruit salad! I couldn’t wait for morning to hit so I could have my salad with my eggs. 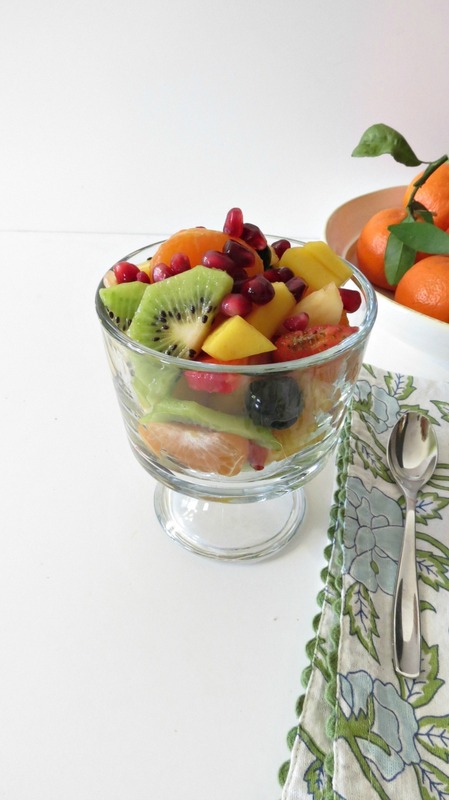 This fruit salad is so sweet and to make it even sweeter I added a pinch of honey! I love Mother Nature! This salad is made with mangoes, pineapple, blueberries, strawberries, a mandarin orange, kiwi and topped with pomegranate arils. To keep the color fresh, I added a pinch of fresh lime juice. I am loving this salad and it’s so simple and I think just beautiful! My Husband sat at his spot at the breakfast table and he saw the salad and said is this for you! I told him nope, your eating it! Ha ha!! He wasn’t to thrilled about it, but then he told me he really enjoyed the salad except for the pomegranate arils. He picked those out. Personally I love them and they add a nice little crunch to the salad. I wanted to give my Husband a little bit of healthiness to his meals. He doesn’t really eat to healthy and to show him I care, I made him the salad. So glad he ate it! I do have to tell you I picked up some mandarin oranges from Trader Joe’s and wow are they sweet and delicious! They are the ones with the leaves still on the stem. They were the best mandarin oranges I ever had!! A light sweet fruit salad mixed with honey and lime juice. In a bowl add all of the fruit; add the honey and lemon juice; mix until combined. Divide between two bowls. You must admit, the simplest things are the most tastiest! I am so loving this salad and I can’t wait to make it for breakfast tomorrow! Beautiful fruit salad! Makes me happy Spring is just around the corner! We are so blessed here to have sunny warm weather almost year round and we can enjoy fresh fruit all year long! I am now craving fruit and spring! 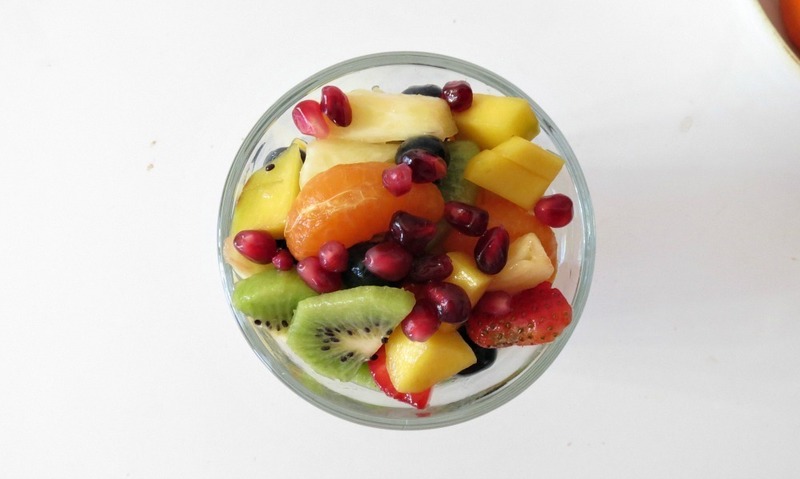 Fruits keep us healthy, they can only be awesome. Looks great Jenat! 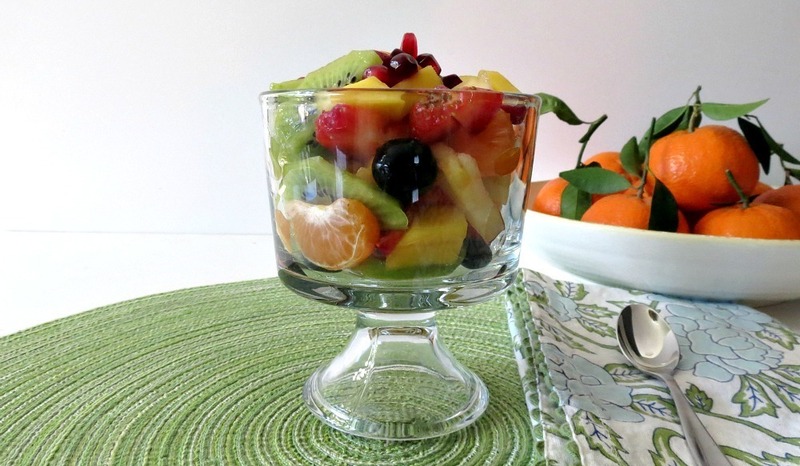 I love making fruit salads with all of the fruits I have on hand in the summertime – which is a HUGE variety of them! I am craving them right now actually. I miss the warm weather! A huge fruit salad would for sure make the winter days seem brighter. I know I miss the summer fruti and warm weather too! It seems like the winter is dragging on. Yummmmm! This has ALL my favorites in it! Plus this would be 0 points on WW! Love pomegranate in my fruit salads, adds a little bit of crunch and sourness! Yummy! I love fruit salad. I find it filling for a sweet treat. I never thought about putting pomegranate in it. I’ll have to try that. What a perfectly fresh and colorful salad!